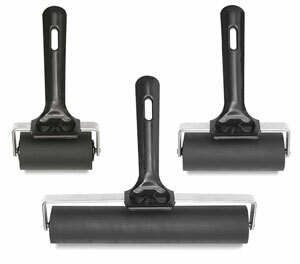 These professional style brayers are hand ground to produce a fully concentric rolling surface,enabling smooth ink application. An excellent choice for block printing, they are also perfect for laminating and other techniques. Strong and durable, they have a heat-treated steel frame,self-lubricating nylon bearings, and an ergonomically designed handle. The handle has a unique molded pressure point that helps in applying even pressure. This unique point also flips to become a convenient stand, keeping the brayer clear of your work. A handy slot makes it easy to hang the brayer for drying or simple storage. ™ Essdee is a trademark.